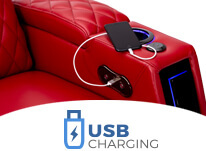 USB port is included in each armrest power recline switch. 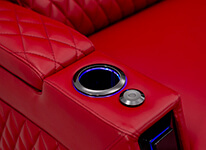 Blue LED lighting peers from behind the etching of these armrests. 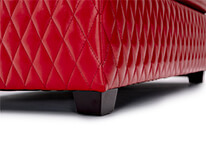 Stretch your legs out and relax with this optional ottoman footrest. 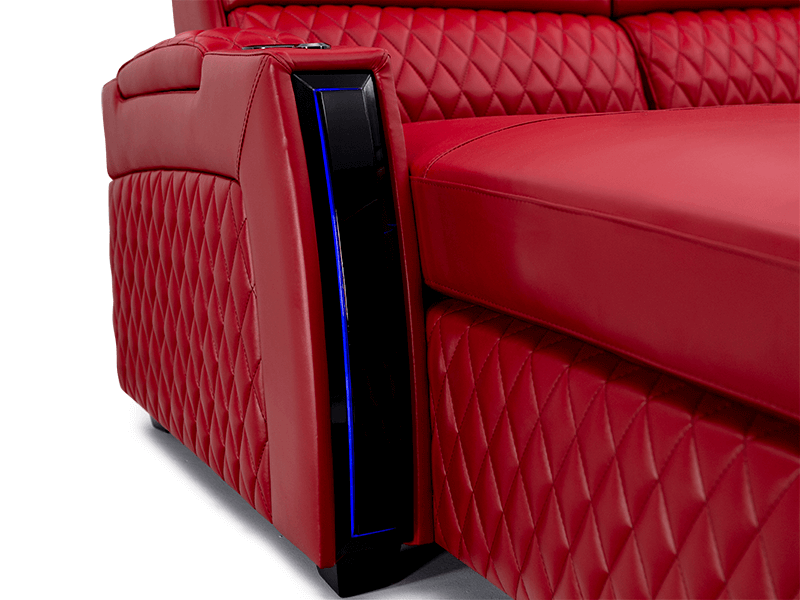 Reclining chaiselounger feature provides full leg and body support. The Solarium welcomes you to the furthest reach of luxury furniture design and artisanship in the world. This empyrean throne is a monument to the intersection of art, luxury, and comfort. 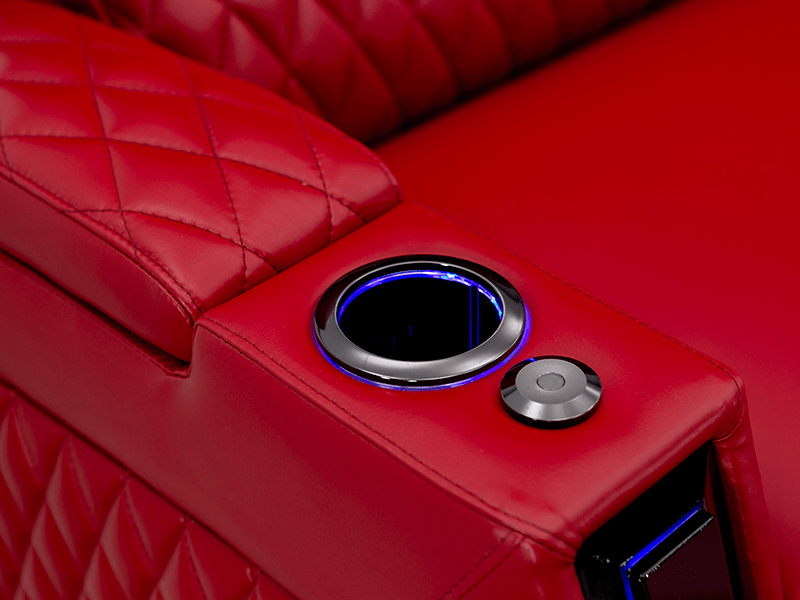 Its scale, radiant blue LED armrest accents, and stellar aptitude to stun with its appearance alone earns its name as the Seatcraft Solarium. 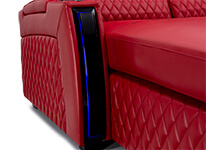 This otherworldly addition to a domain does more than captivate with looks, it unburdens the body with cool leather gel, deeply woven layers of high density and long lasting memory foam, ergonomically perfected lumbar support pads with diamond-stiched reinforcement, and power reclining backrests. 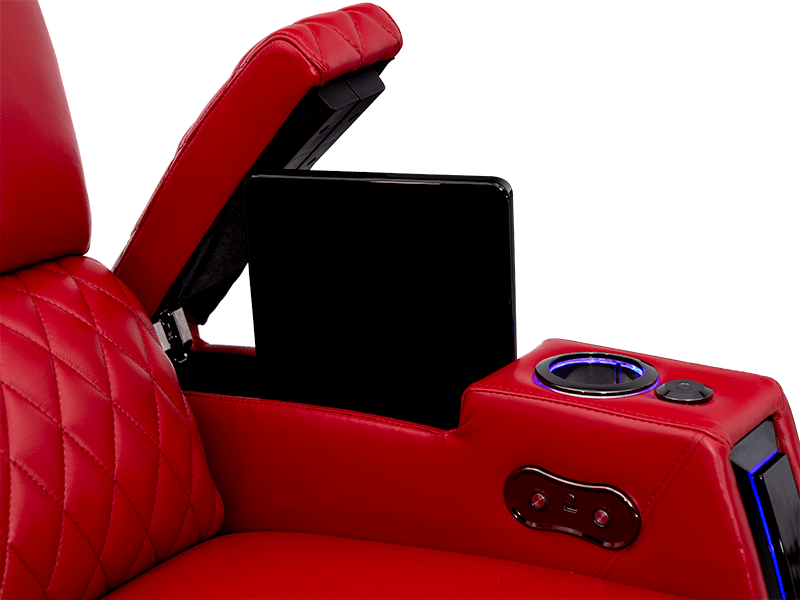 Yet surprisingly the Solarium does more than alleviate the body, it engages the mind with pragmatic features such as USB charging, in-arm storage for electronics or conveniences, cupholders, and accessory grommets. For once, should you want the greatest evening, or even lifetime of evenings, that feel and look as astronomically vast as your dreams could imagine, it can be reliably found in the Seatcraft Solarium; and those evenings will be more comfortable than you can imagine in this behemoth of a sofa. 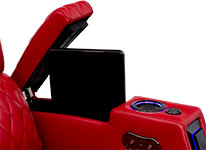 It's durable, it feels incredible years and years after enjoyment, it offers features beyond furniture, and, you can choose it to be upholstered in any of our Your Choice™ premium line of materials; from the deep and rich top grain leather 7000's, to the most silken, soft plains of Bella Fabrics. This feature adds to the potency and comfort of traditional memory foam cushioning, by infusing special gel beads into the visco-elastic foam stuffing of the furniture. These beads help to dissipate your body heat, which keeps the seating surface remarkably cool even after long hours of use. This also results in greater seating durability, as the response time for the cushion to return to its original shape is shortened, resulting in less outer wear. 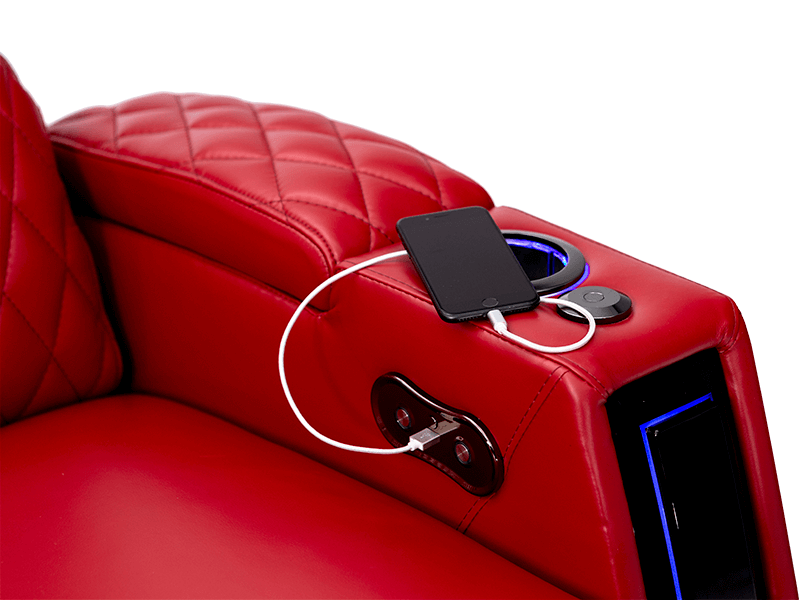 Cool gel is perfect for those who spend a lot of time in their media lounge furniture, as it stays comfortable and retains the shape of cushion. 2.2 density memory foam is a type of visco-elastic foam cushioning that allows the furniture to conform to your body’s natural contours, and then conveniently return to its original shape after use. This foam responds to your body’s weight and heat, relieving pressure points that help to reduce the stress and stiffness acquired after long hours of furniture use. The thickness of the foam coating feels firm and has a gentle cradling effect. 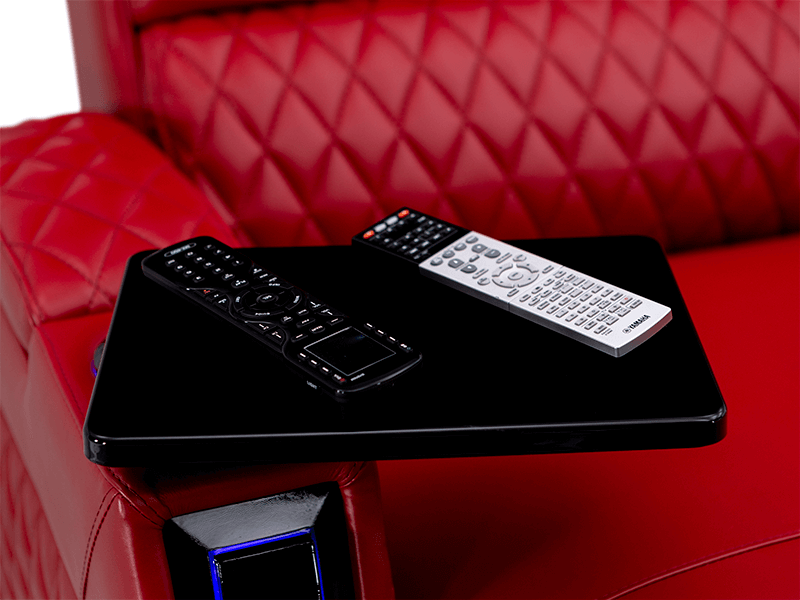 Memory foam gel also helps the cushion to resist dust mites, bacteria, and mold, for a healthier seating surface. The Your Choice by Seatcraft series proudly offers exceptional durable wood choices for the frame construction. The wood undergoes a special kiln drying process which removes the moisture from the wood, making it stronger yet lighter in weight. The big advantage is that after this process, the wood becomes much less susceptible to moisture and warping from climate changes, while maintaining the robustness and integrity of the wood with no chemicals.